For many Agile Teams in large corporations, the teams are being confronted with “Review Season”. No matter how hard Scrum Masters, Coaches or Team members try and change the corporate culture in this regard, the team needs to SURVIVE. There are many sources of material about why this is not a great practice for the building of high-performance teams, so I won’t get into that here. I’ve put some links at the bottom of this post if you want to read more. The purpose of this post is to introduce an alternative approach that will allow the team to regularly reflect on its’ own progress (not just once a year, but when the team decides will work for them), and at the same time possibly (PLEASE read…OPTIONALLY) use that knowledge for their inevitable yearly review. Please don’t get me wrong. I believe teams should be considered as teams and my preference would be to avoid such a situation. 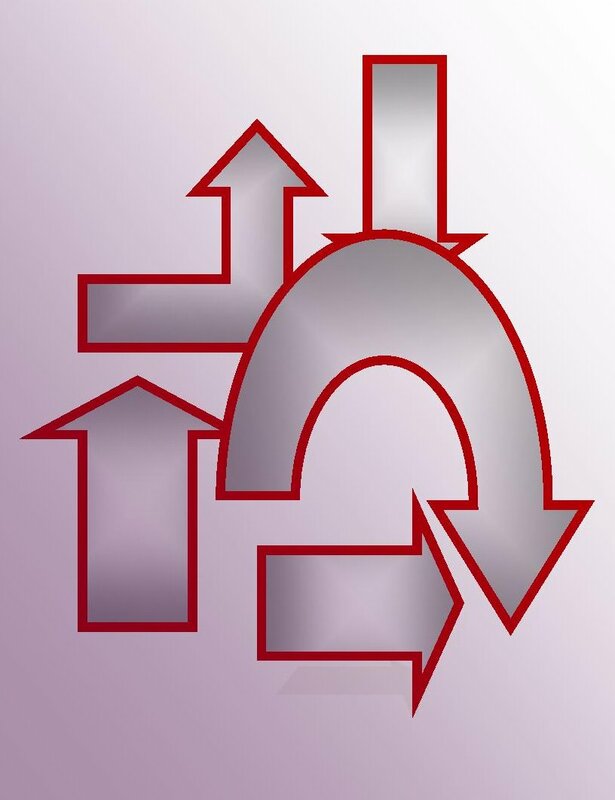 The reality is that if your organization is transitioning from non-agile to agile or simply considers Agile to be for isolated teams, you will inevitably have to deal with this. 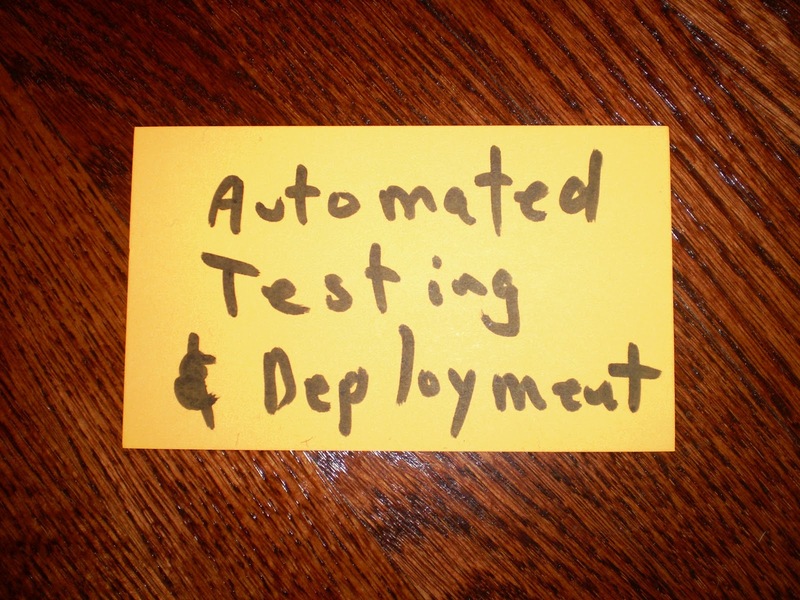 It won’t go away until Agile becomes more mature OR it may never go away. 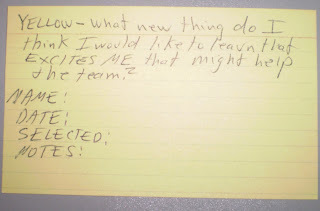 I started thinking about an alternative to just getting all my team members fired for saying NO and came up with this useful approach that seems to allow the team members to be comfortable and grow with each other, and IF THEY WISH, use that information as food for thought for their reviews. I cannot stress this enough. It HAS to be OPTIONAL for team members to use the information for their reviews. The TRUST relationship between team members MUST remain in-tact. I originally used a method back in the early 90’s to help my team organize itself to complete a large project involving over 100 cities. We needed a way to improve each few weeks to make the project profitable. Self-improvement and learning new skills as we went was important. Every few weeks (usually 3) we got together to review how things were going and to decide what we needed to improve. What we did was take all the necessary skills, wrote them on cards, placed them on the floor and then had discussions about them from each individual about what we saw going on. It was lots of fun. I recently saw something similar during an Agile Coaching retreat I participated in with Berteig Consulting. I had been struggling with how to deal with the inevitable yearly review that was to take place for some newly formed teams in a large company with very strict procedures in place from Human Resources. I realized that if I combined my experience from the past and with the great reminder from the recent retreat, I could create an exercise that could allow the team members to learn about each other and themselves. At the same time they could receive some “food” or “information” about themselves as it relates to them in their teams for their reviews (that being the secondary purpose). I thought I would try this exercise from my past. It worked well in the 90’s for team, building. Why would it not work now? The results were wonderful. The team members got to know more about each other, and how the rest of the team felt they could improve to help the team. MOST IMPORTANTLY, it allowed the team members to express what the felt as INDIVIDUALS. It was a great learning experience and I think could help many teams out. That’s why I’d like to share the idea here. It is VERY IMPORTANT that you let the team know that what is learned during this Retrospective will be kept PRIVATE and within the team. Please be VERY open about the fact that you are doing this for the TEAM to improve and for them to learn about each other. Sharing the information is 100% OPTIONAL. DO NOT STAND DOWN ON THIS, or you will lose trust from the team. Let’s assume you have a team which has been together long enough to start to know each other’s strong and weak points. They know what each team member can do for the team. The team will need to have Stormed already and be prepared to talk openly with each other. I don’t think this exercise will work with a team who hasn’t gone through storming yet, but I may be wrong. I would simply be nervous to try it with a brand new team where trust has not been established yet. I think the results could be bad for team morale. Therefore, please be careful. If you do try it with a brand new team, please let me know. I’d be interested to know how that worked out (good or bad). Here are the mechanics. Maybe you’ll find this will work for you. For a team of 7-9, it would take about 1 ½ hours to do with proper discussion. For a team of 5, an hour may be fine. I haven’t tried with more people at the same time. No one is invited except for individual team members. NO MANAGERS! 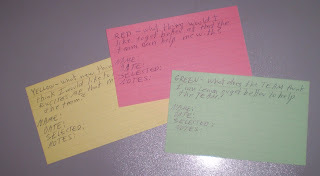 One Red, Yellow and Green card for each team member. 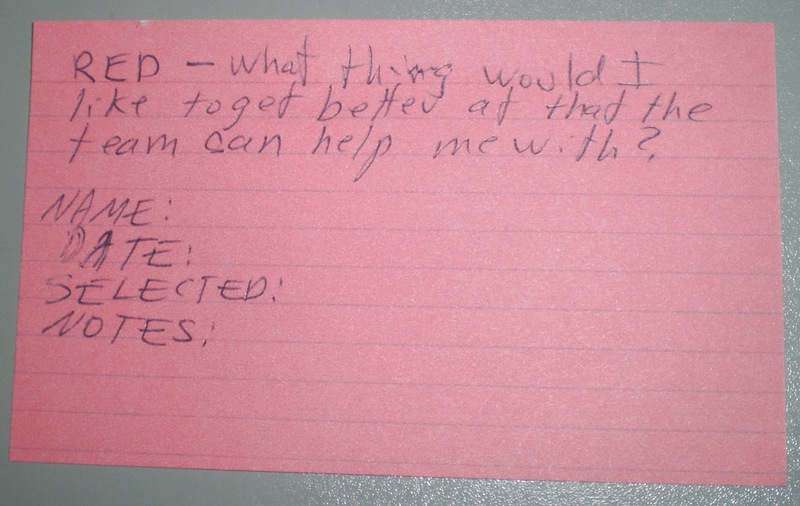 On the Orange cards, you’ll need to write some topics for the team to discuss. You’ll need to make up the cards the FIRST time. I suggest you don’t get a manager to write them the first time. They may want to control the cards to serve some purpose instead of just helping the team members to get to know each other. 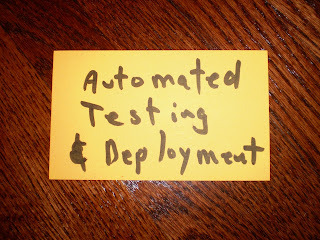 If you can, ask a Scrum Master or someone you trust to make the initial batch of cards. It would be best to ask someone who’s been coaching or WORKING WITH the team for a while as they’ll know what things the team might be struggling with or might be prepared to start learning. Just remember, it’s not about what can help the management, it’s about what can help the team grow (which in turn will help the management). I should note, if you have a good relationship with the managers in your area, DEFINITELY get some feedback from them if you feel it’s appropriate. That will have to be up to you. Here is a starting batch of cards which might work for a Web Development Team. 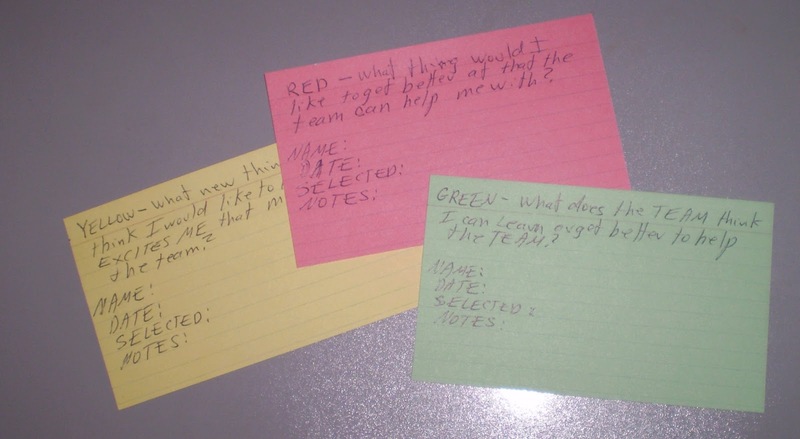 Spread these cards out over the floor in a way that the team members can easily walk around and look at them without bumping into each other. They should be close enough though so that they feel they are “in this together”. Explain to the team why they are doing this and that the results are TOTALLY PRIVATE and that it MAY or MAY NOT be something they will use for their reviews. It’s important to explain to the team that something like this could be used on an ONGOING BASIS and doesn’t need to be restricted to only once a year. Let the team know that if they like it, they could do it regularly at their option. It will not be mandatory. This allows everyone to be open-minded. Make it clear there will be 3 ROUNDS. The first TWO rounds will be for each team member to talk for themselves while the rest of the team listens. The third round, the team member may NOT TALK. The team will talk and the single team member should LISTEN. There will be a follow-up open discussion if everybody wishes. YELLOW – What new thing do I think I would like to learn that Excites Me that might help the team. Make sure they write the word YELLOW in the event the cards get photocopied for future use. Now, ask the team members to walk around looking at the orange cards on the floor for which card BEST represents them as individuals. 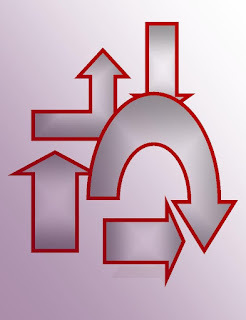 Re-enforce that individuality is important in an Agile Environment to help the team. All team members are important. Allow enough time for proper reflection while the team members consider their options. Hopefully you have selected some topics which are appropriate to what you have witnessed as being their needs and desires. Remember, this is for the TEAM. When each person is standing by a card, explain and remind everyone that the goal here is for “us to learn about each other and what our individual goals and needs are. It’s important for the rest of the team members to LISTEN, REALLY listen to what makes your team mates excited. You will learn a lot from each other (something like that)”. Ask them to write the EXACT wording on the card they are standing over in the SELECTED: field on the card. Remind them that these cards are PRIVATE and the NOTES section is JUST FOR THEM. Keep everyone standing. Start at the right or the left from your perspective. Your selections SHOULD be random and not individual, so left to right or right to left will be fair AND ACCEPTED). IF possible, start with someone that you know will be receptive to this process to start the process off (especially the first time). Ask each person to explain WHY they chose THAT particular card, explaining to the others to “Please listen. This is important to your team member and can really help the team to learn about each other”. They MAY look down at their cards and start explaining, which should not be discouraged. The “lifelessness” of the cards is what helps here. They are just objects, not emotions. There may be a tendency for the individuals to talk to you (as the coach or facilitator). Simply find a kind way or gesture to have them talk to their team members instead. You will need to let everyone know that there is a time limit for each team member. Make it long enough so someone can properly express themselves. 5 minutes should be fine. If someone wants to pass, let them and give them another opportunity AFTER everyone else has spoken. They may surprise you (and themselves). Hopefully, by now the team members are already comfortable talking openly with each other. When this is complete; do the SAME thing with the RED cards. RED - What thing would I like to get better at that the team can help me with. Repeat what you did for the YELLOW Cards. Remind them to write RED for photocopy reasons. Allow the same private reflection and discussion. GREEN – What does the TEAM think I can get better at or learn to help the team. This time the process is VERY different. Ask all the team members to SIT DOWN. Ask for a VOLUNTEER if you can get one to be the FIRST person to try the Green Card. Ask the first team member to STAY SEATED and ask the rest of the team to Stand-up. The person who is SEATED should LISTEN VERY CAREFULLY and TAKE NOTES. They may NOT say anything. They are to listen. The rest of the team will wander around the cards discussing what THEY think the BEST card for the person sitting down is and WHY. They have 5 minutes! The team members may ask if there is a special format. The answer is NO. It is up to the remaining team members to discuss amongst themselves what would be the most appropriate card to select and how to determine this. The ACT of discussing it amongst themselves will force open discussion amongst the rest of the team members as to what they should select. This MAY start off slowly. Don’t worry. Simply count down every minute to let the team know they must come to a consensus. As the time counts down there will be more and more comments (both positive and negative) from the perspective of the other team members. Encourage the person sitting down to only listen and those that are talking to talk AMONGST THEMSELVES and not to the person sitting down. Under one minute, you MAY need to remind them in smaller time increments. The team will eventually select something after a considerable amount of open discussion (which of course is the goal). The GREEN card is a very important part of the process because it allows team members to know what things they can improve or learn from the team's perspective. The time-boxing is important to keep the team focused on POSITIVE discussion and improvements. Some negative feedback may come out, but it will be done with the intention of giving positive feedback to fellow team members. Remember, the time-boxed goal is something positive. The conversation should quickly return there. Please give the “sitter” a chance to write all the notes they want. Explain that AFTER we are done, each team member can talk about their experience if they wish. Now, each team member takes turns sitting down and LISTENING to what the team has to say as cards are selected for them. Some team members may learn of new skills that their team members think they might be good at or should learn that they were not aware of or never considered before. The results could be total unexpected, which is part of the experience. What is important here is that the individual has been given their OWN voice twice and been able to listen to the TEAM’s voice once. It seems to be a very happy mix. When the selection has been made the standing team members explain why they chose what they did to the person sitting down. You find it easier to just have them say "We have chosen X". Remember, the person sitting down has already heard the team talk about why. I find this part of the exercise to be the most intriguing and amazing. In some teams, the members will select skills that complement each other. In some teams they select a skill that the “sitter” never expected. In some cases, members will select based on what the person sitting down originally said they had interest in during the first two rounds. They all really get to know each other as individuals! The team learns how their individual desires and capabilities add up to help the whole team. The reason for writing the EXACT names on the cards is to avoid specifics and to allow for future comparison. 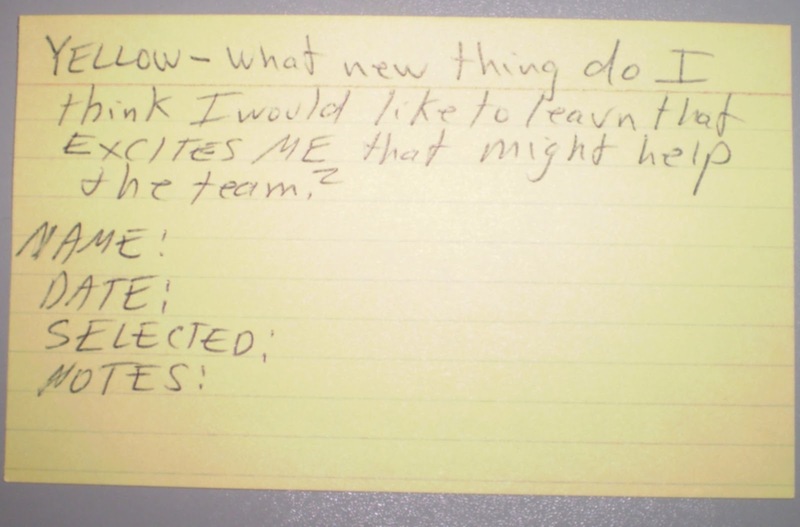 Eventually, it should be up to the Team, Scrum Master, or Coach to come up with some new cards if they feel it would be appropriate. Likely, your managers will want to get involved in this. Deal with that the way you wish. My preference would be to obtain some input from the management and include their ideas IF it would be to the benefit of the team. For me at least, it’s about what the team needs. The management does have needs though as well which should be considered. If you can do it, it might be a good idea to ask for input (if not at first, but for future sessions for sure). A card such as “Working more overtime” is of course inappropriate. If the manager knew they were trying to break into a new “Wireless” domain in the market, a card such as “Wireless Networks and Technologies” might be a great idea. Maybe no one will pick it. This is also not a bad thing. Perhaps the management needs to know that "Wireless Networks and Technologies" aren’t important to their staff and the company needs to do some education into the corporation’s future path. The message has obviously not been communicated properly. It’s just important the cards stay consistent for a while so there is a point of comparison for TEAM MEMBERS. There may be some unintended positive results. 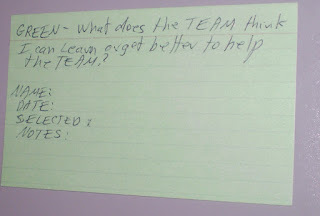 The team, Scrum Masters and Coaches now have a “common vocabulary” for discussing team member motivations and ideas. 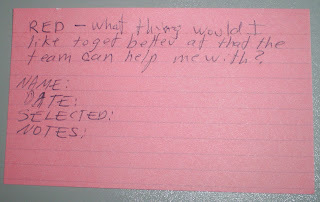 I found that after this exercise was complete, if I was sitting with a team member and wanted to help them to proceed, I could FIRST ask them “What was your Red Card if you don’t mind me knowing?” It was a great way to make sure that I was in touch with what the individual’s goals actually were instead of mine. Encourage the teams to do this often. It allows them to really get to know each other as team members and improve as a team. A happy by-product of this is that they have the OPTION of using that information for their yearly review process to make it less painful for themselves (and their managers). I hope this method helps your teams to become more effective and to get to know each other better as individual contributors to the common goals of the team. This document may be reproduced in-tact without modification and retaining the attribution to Mike Caspar, 2012.